Custom Patio Umbrellas Personalized in Bulk. Promotional, Inexpensive. Lowest prices in USA and Canada. High quality, yet inexpensive patio umbrellas in bulk, customized with you logo. 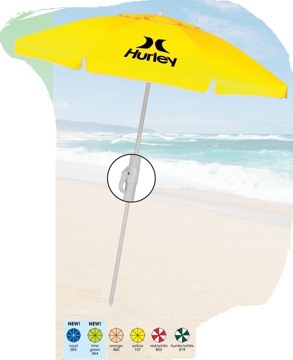 Our personalized patio umbrella is manual open with a steel powder coated frame. The vented canopy is made of polyester fabric. Powder coated 2 piece pole with tilt has pointed end for easy ground penetration. 90" H x 86" We also supply blank (not personalized) patio umbrellas at EQP (End Quantity Price). Free artwork design. American clients pay no taxes. The unit prices below include your 1-color custom imprint on one panel. Add $1.60 for each additional imprint color. We also supply blank (not personalized) bulk patio umbrellas at EQP (End Quantity Price). • 86" diameter, 90" high. • Imprint Area: 17" x 14"